MediaPlayersVideos is a free browser add-on built on the Crossrider platform. The program is compatible with Internet Explore and Mozilla Firefox, and, upon installation, the program start monitoring the user in order to collect certain non-personally identifiable information. The MediaPlayersVideos program is bundled with other free programs, which means that you have to be extra cautious when installing freeware, because you may find that MediaPlayersVideos is presented as an additional program. This type of software distribution is very common, and, if you want to prevent similar occurrences in the future, you should pay more attention to every installation process so that you do not have to remove unwanted programs afterwards. Moreover, it is important to keep the system protected against malware and spyware because not all software installers provide information about programs that will be installed. MediaPlayersVideos displays third-party advertisements on shopping websites and non-commercial websites. The content of the pop-ups, web banners, and other types of advertisements provided has nothing to do with MediaPlayersVideos. MediaPlayersVideos is not liable for the advertisements displayed, which means that you use the program at your own risk. The presence of MediaPlayersVideos may be indeed annoying because the program shows offers that are not necessary related to your interests or browsing terms. For example, when browsing amazon.com, you may find MediaPlayersVideos pop-ups offering you to check out some items available at ebay.com, target.com, and other websites. Note that some unknown websites may also be advertised, including unreliable ones, which is why we recommend that you remove MediaPlayersVideos from the computer as soon as you can. You may be invited to install a program that is presented as a system optimization program, such as Windows PC Repair. It is also possible to encounter offers to install systems scanner or try out some services. Ignore all those offers in order not to get deceived by online scanners, and, the sooner you do it, the better. As regards the removal of MediaPlayersVideos, we recommend implementing SpyHunter. This real-time security program eliminates the unwanted program for you and safeguards the system against Trojan horses, rogue anti-virus programs, browser hijackers, adware programs, and many other threats. 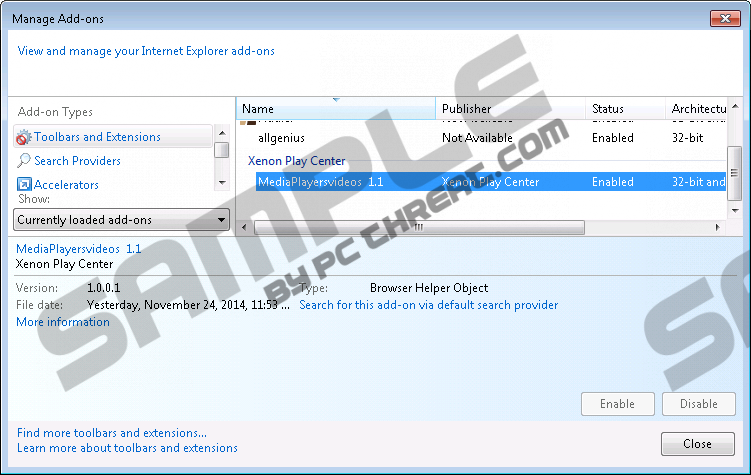 It is possible to uninstall the program, but, after removing the advertising-supported browser add-on, you should implement a reputable system scanner. Select Uninstall a program and remove MediaPlayersVideos 1.1. If you want to be sure that your operating system is malware-free, you should scan the system as soon as you can. Our advice is to use SpyHunter, whose scanner is available below at no charge. Quick & tested solution for MediaPlayersVideos removal.